Welcome to Emmaus Lutheran Preschool. At Emmaus Lutheran Preschool your child will be encouraged in their spiritual, intellectual, social, emotional and physical growth. We strive to maintain a balance of child-initiated play with activities that are teacher-directed, to provide a well-rounded experience. We take a developmental approach to Preschool, where children learn through play. At our Preschool you will find hallways and classrooms filled with the sounds of happy, busy children actively involved in learning new things. 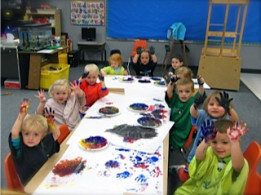 We offer a flexible class schedule for Preschool. You may choose to have your child attend, 2 days, 3 days, 4 days or 5 days. They may come either just for the morning session (8:15-11:30) or all day (8:15-3:15). -articulating needs in an appropriate manner. We offer both a Monday-Thursday session or a Monday-Friday session. They may come for either the morning session (8:15-11:30) or all day (8:15-3:15). Our Pre Kindergarten Classes utilize different educational resources within the curriculum including the Zoo Phonics curriculum and Scholastic Weekly News. Our ratio in Pre-Kindergarten is 10-1.